Most of Stepan Sarpaneva’s timepieces involve the moon in some way. And of one thing I am certain: it is surely Sarpaneva’s stylized rendition of the earth’s satellite that has drawn me to his work in such a magnetic way. The moon seems to draw Sarpaneva himself in, but this trademark element came about in a bit of a surprising way, with much less advance planning as one might think. And, surely, this is how the best things come about. “It began with an idea to mix old and new,” he says, citing the fact that in vintage watches the moon’s “face” was distinctly visible in moon phases. He relates that around the 1930s the “face” element disappeared, following the style of the day, leading to a more modest modern era for moon phases. In fact, when you look at most moons on watches today, you generally see more realistically themed craters and such. The man in the moon has been more or less left to Sarpaneva’s crazy face in this modern age of horology. I know for certain that this man in the moon – which is a stylization of Sarpaneva’s own face – is what personally fascinates me most about his watches. This moon, which generally falls in the 10 mm diameter range when it is fully visible – yes, that is rather large, joyfully – made its debut in 2008 in the Korona K3 timepiece. “I had just made a bigger aperture for my moon phase,” he relates. “But just having the color showing through seemed really sad and plain. My watches have a modern flair, but this really needed something else.” Between Sarpaneva and his engraver, they came up with a gold, engraved moon that looks like nothing else on the market. To this day, it remains his trademark. “Indeed, this moon is my best friend and my worst enemy,” he remarks somewhat enigmatically. 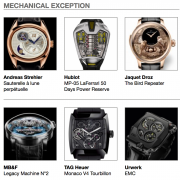 Sarpaneva sells most of his timepieces directly to his end clients. And because of this, he is happy to customize his watches. Sometimes this results in fairly unique, one-off models. The Korona Doublemoon I had the pleasure to wear for a while earlier this year is a timepiece that arose from one of those situations. Sarpaneva had recently created a “double” moon phase based on the modifications he makes to the automatic Soprod A1 base. The “double” comes from the fact that the dial shows mirror images of the moon phase: the aperture at the top of the dial is the phase in the Northern Hemisphere, while the aperture at the bottom of the dial displays the mirrored phase in the Southern Hemisphere. The modification also allows the moon phase to be set and adjusted by the crown, a degree of comfort that very, very few timepieces containing such a large degree of complication can provide. The double moon phase is yet another variation on Sarpaneva’s own moon face, but here all we can really see are the quirky eyes created in a silvery bath of gold. With the waxing and the waning of the moon’s phases, parts of the eyes get covered and revealed and covered again by a shutter, which is crafted in a beautiful steel coated with Sarpaneva’s trademark blue DLC and perforated by tiny stars cut into the metal. The silvery glow of the moon shines out from behind them, but only enough so that we know they are little stars. It is the gorgeous cornflower blue depicting the night sky that captures and keeps our attention when the moon is hardly to be seen – both in the sky and on the wrist. The whole thing is topped off by Sarpaneva’s characteristic grille covering the dial, allowing only parts of the mechanics and the starry sky to shine through. He handcrafts the grille in stainless steel, his preferred metal. This lends the dial a unique liveliness rarely found on other dials. The hands also crafted in stainless steel are not amplified by the use of Super-LumiNova or any other luminous material, but legibility is not a problem, not even in ambient light. Thanks to their clever faceting, they perfectly reflect any light source, making the hands legible at almost any waking time. The case of this particular model is the thinner 42 mm Korona case. Now, I need to explain something about why I mention this. My personal preferred case size is 38 mm, and though I don’t necessarily think larger sizes are too, too big (depending on the height, naturally), this 42 mm Korona case almost seemed like one of my beloved 38s due to the ease in wearing it. The height remains über-svelte, which is quite unusual for a complication of this magnitude. From the top of the hands down through to the moon, there are close to 15 layers of elements in only 2.3 mm of vertical space. To so precisely house this automatic complication in such an elegant modern case borders on insane. The lugs, too, are just perfectly proportioned and curved to aid in the wearing comfort. The Korona case boasts an interplay of polished and matte surfaces in addition to the “exploding” design resembling a light corona in the sky. It is not only beautiful, but very, very easy to wear. Additionally, the crown – much like those that Speake-Marin prefers – is quite unusual and aesthetic in its visuals while remaining very easy to use and handle. (In case you weren’t aware poky, little, poorly designed crowns are a pet peeve of mine.) The Sarpaneva crown is gorgeously designed to appeal to its wearer and incite interaction. The Korona Doublemoon’s rotor is another Sarpaneva specialty. Its skeletonized beauty is enhanced by the light, airy rendition of the characterized moon winking up at the wearer, hinting that it is trying to communicate a private secret. In combination with the Korona case, the celestial allusion, the lunar symmetry, and the goldsmithing talent of Sarpaneva, the holistic beauty of the unpretentious Sarpaneva concept and execution comes dashing to the fore. And in this case, the moon’s creator looks out at us, rather than us up at the man in the moon. This is a view that I personally adore. For more information, please visit http://www.sarpanevawatches.com. What an intelligent complication! Tidy review – thank you. With pleasure! Glad you like it — the review and the watch!